Back in September, I met a couple, Annie and Griffin, walking in lower Manhattan. They were fully-sleeved and, although I don’t often feature sleeves because they are hard to truly capture in a two-dimension setting, their work was remarkable. First up is Annie, whose work was done by Kahlil Rintye (@kahlilrintye) at Ed Hardy’s Tattoo City (@tattoo_city) in San Francisco. 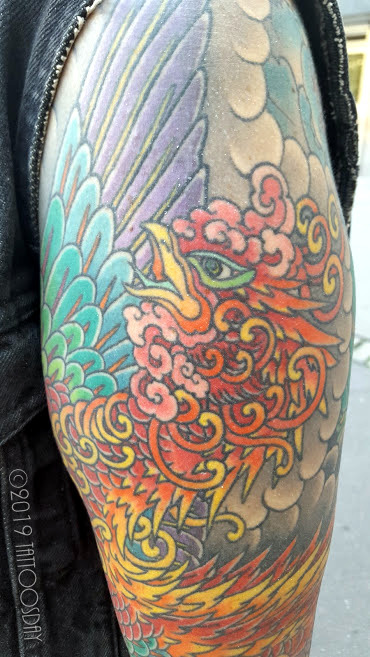 That rooster and colorful sleeve are really quite beautiful! Annie’s travelling companion Griffin, on the other hand, had a sleeve in black and gray, inspired by the work of HR Giger (@giger_art). He referred to the figure above as his guardian angel. Griffin’s work was by Dustin Burt (@dustinburtart) at Sugar City Tattoo (@sugarcitytattoo) in Crockett, California. Thanks to Annie and Griffin for sharing their sleeves with us here on Tattoosday! 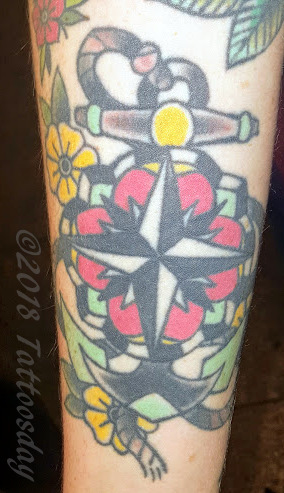 This entry is ©2019 Tattoosday. 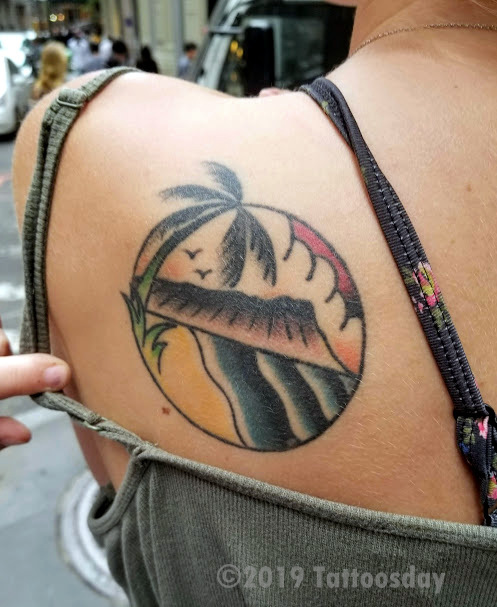 Back in September, I met Sarah on William Street in the Financial District and had to ask her about this tattoo, which depicts the world-famous view of Diamond Head from Waikīkī Beach in Honolulu. 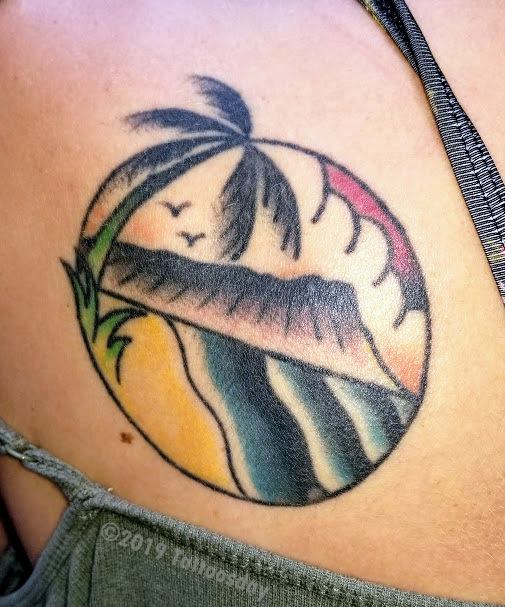 Sarah told me she had gone to Bound for Glory Tattoo (@boundforglory_nyc) in Staten Island and asked the artist Dave Borjes (@daveborjes_bfg) for a palm tree. He gave her that and a whole lot more with this super cool tattoo. Thanks to Sarah for sharing her awesome tattoo with us here on Tattoosday! Back in the summer, I met Blakely on Wall Street and asked if I could snap a photo of her tattoo. The citation is Philippians 4: 6-7, New International Version. Blakely told me it is her favorite verse, as she suffers from anxiety, and this passage helps her cope with it. There’s an article in Huffington Post here about this specific verse and its meaningfulness in today’s world. She did not remember the name of the artist who did the work, but did note it was inked at Rose Tattoo Parlour (@rosetattooparlour) in Williamsburg, Brooklyn. 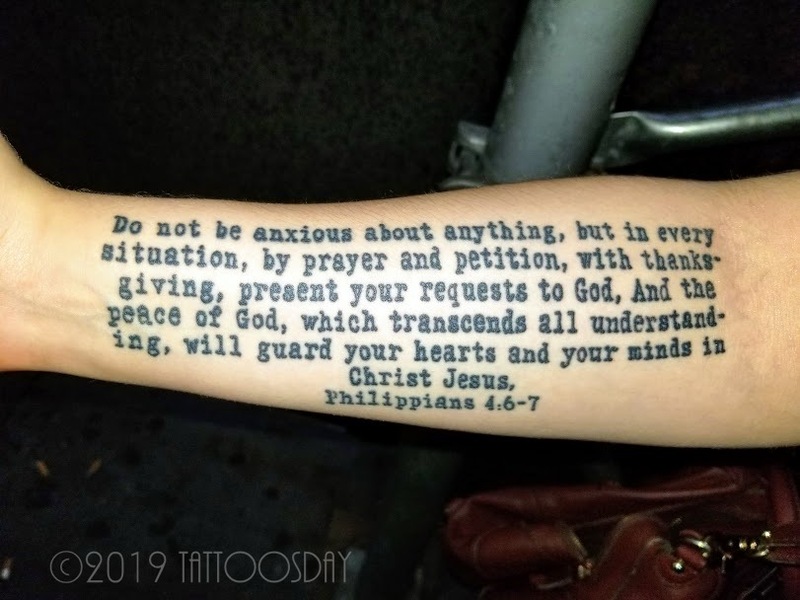 Thanks to Blakely for sharing her verse with us here on Tattoosday! Look: we know that students get distracted, dammit, and sweeping technology bans remain the best answer to the dilemma. It’s a well-established fact that devices distract students so much that we’re better off keeping them out of class altogether. Students spending the entire lecture period on eBay and YouTube are not only interfering with their own learning, they’re disrupting the learning of students seated around them. We don’t need research to tell us that distracted students don’t learn effectively (though it does indeed suggest exactly that, to be sure). And since “distraction” equals “poor learning outcomes,” let’s prevent the things causing those distractions, and keep digital devices from entering our classrooms. I’m all in favor of successful student learning, and this seems like inexorable logic. Now, you might ask if a bunch of articles relying only upon anecdotal data and the same study that’s now been called into question is a legitimate case for unilateral pedagogical decision. As an academic with over twenty years of classroom teaching, I’m certain these conclusions hold true for Today’s Students™, and I know it’s true because I had a few students in my survey course who used their laptops to go on Facebook that one time while I was lecturing about the Hawley-Smoot Tariff, and then they all missed that question on the exam. Who can be against students learning more effectively, by which I mean scoring higher on exams delivered in contrived studies, if we have the means to facilitate doing so? Whose side are you on: order or anarchy? Since previous generations of students were all raptly attentive and appropriately docile in our lecture halls, and Kids These Days™ aren’t, we should ask ourselves what’s changed, knowing full well the answer is the internet. If we remove this contagion, the disease of distracted students, staring zombie-like at their screens instead of staring zombie-like at the professor on the stage thirty rows away, will be cured. The only question is why should we stop there? The potential student-distractors in our classrooms are legion. If, in the service of better learning for all, we are going to eliminate distraction, let’s do it right. Laptops, tablets, and phones are distractors, so my policies of course ban these technologies in the classroom. Indeed, technology, as we all know, is a primary culprit when it comes to stealing our students’ attention from where it rightfully belongs. So what other technologies are luring my students, siren-like, away from my scintillating, witty, and painstakingly-crafted-by-the-word lectures? Even if students are taking notes longhand, a quick examination of a section’s worth of class notes will likely show you a wide range of doodle artwork (most of it questionable quality, at best) . If the research shows us that multitasking is just another form of student distraction, then we have to conclude that doodling is taking the learners’ attention away from where it properly belongs. So I am banning pencils and pens from my classroom, lest the scourge of doodling prevent my students from achieving successful learning outcomes slightly higher exam scores. Of course, this type of reflection about the ways in which technology is the bane of attention spans has led me to think about my own use of instructional technology. If a student using a laptop distracts themself and those around them, then my projecting a computer’s screen on the front wall of my classroom must be doing the same thing, but exponentially. How can my students learn if I have these…computer things so prominently visible? From this point forward, I will no longer enable student distraction; I will stop using slides, images, illustrations, projection, and–to be absolutely sure–outlines, the whiteboard, hand gestures, pastel-colored shirts, and anything else that might divert students’ attention from my lecture–because that’s where all the important content is. Since we all know that, given even a scintilla of opportunity, students will automatically disengage from class and do their own thing (evolutionary psychology tells us this is a present-day manifestation of our ancestors’ fight-or-flight response), we have to remain vigilant against the door to distraction opening even a tiny crack. Beginning this semester, I’ve removed one of my chief competitors for students’ undivided attention by teaching only in classrooms without windows. Just as staring at a tiny window with a webpage on it prevents learning from occurring, so too does staring through a larger window at whatever non-class-related material might lay outside. As I’ve refined my classroom-conduct and technology policies to account for this epidemic of distractors, though, I have come to a startling realization. Maybe we’re going about it all wrong; instead of worrying about what interferes with students’ attention, maybe the problem is attention spans themselves. As several Eminent Tenured White Men have demonstrated, the internet is indeed shrinking the attention spans of college students. If we calculate a constant rate of declining ability to focus, and multiply it by the number of years the internet has been a thing, we can’t avoid the harrowing conclusion that most–if not all–of our students are actually in negative numbers when it comes to available attention spans! This makes perfect sense, of course, now that I see things in the broader view. All of the lectures I remember from my own undergraduate experience are ones where I was certainly paying attention, and I am almost 30 years older than my first-year students. I shudder to contemplate all the ability to focus that’s been lost in that three-decade period. It’s a tragedy of immense scope, and it leads me–sadly–to the unavoidable conclusion that the only foolproof way to remove distractions from the classroom is to ban students. It’s regrettable, but if successful learning means doing so free of distraction, I am compelled by this incontrovertible logic to ban devices, writing implements, windows, and students from my learning spaces. Facts don’t care about our feelings, after all. These hard choices are also necessary ones if we are to provide a completely distraction-free learning environment. Nothing is more distracting than learners themselves, given their innate inability to pay attention and their base proclivities to take any opportunity to disengage from the compelling and erudite lecture I am providing for them. 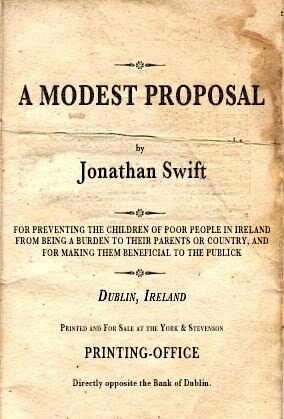 Finally able to unfold in a completely distraction-free space, my lecture on the Hawley-Smoot and Fordney-McCumber Tariffs (they are essential turning points in US financial history, and remarkably understudied, as I detail in the lecture’s extensive discussion of tariff historiography) will finally have the space it deserves. This is the platonic ideal of teaching, then: nothing getting in the way of the essential content I am dispensing. In this regard, the laptop-ban conversation might be the best thing that’s happened to my teaching practice. The logic, after all, speaks for itself. I met Marcy on a subway platform in lower Manhattan back in September 2017. She had a lot of work on her arm and indulged me as I took quite a few photos. This building is part of the Oceanic Hotel on Star Island in Isle of Shoals, New Hampshire, where she used to vacation when she was younger. 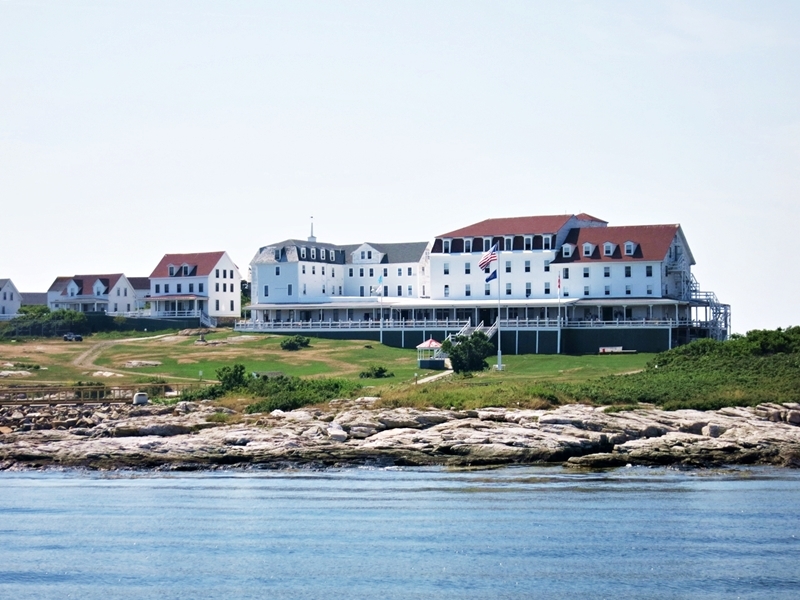 This Cape Cod-style lighthouse helps her find her way in life. Marcy credited her work to Becca Genné-Bacon, who tattooed her when she was at Hand of Glory Tattoo (@handofglorytattoo)in Brooklyn. Becca has since moved on to Kings Avenue Tattoo (@kingsavetattoo) in Manhattan. I love Becca’s work, and follow her on Instagram at @beccagennebacon. Thanks to Marcy for sharing her awesome work with us here on Tattoosday!